It’s no secret that David Arnold is a good friend of mine, and that we occasionally read for one another, but trust me when I say that even if I’d never met him, I’d still be a fervent fan. There’s just something about the way his characters see the world — hope and wonder tempered with dry, razor-sharp wit — that is simultaneously endlessly fun to read while being deeply moving. I’m not typically the speediest reader, but with David’s stories…well, let’s just say that if they were cookies, I might as well be a hairy blue monster with giant googly eyes and an insatiable sweet tooth. And after David’s phenomenal debut Mosquitoland, I know I wasn’t the only one waiting with bated breath for his sophomore novel, Kids of Appetite. Also, to pull back the curtain just a tad, I’d like to draw attention to this video David made about the four individuals with Moebius Syndrome who helped him bring Vic to life. As I’ve heard him say many times, they did more than just help him get Vic right; without them, there would be no Vic at all. It’s always a little risky, both as a writer and a reader, taking on a book told from multiple points of view. It’s hard enough to find a book with one narrator I love, let alone two or more. Throw on top of that a non-linear structure — KIDS OF APPETITE opens on a scene that actually takes place near the end of the story, with the bulk of the narrative told in flashback — and in less capable hands, you might have a recipe for literary disaster. 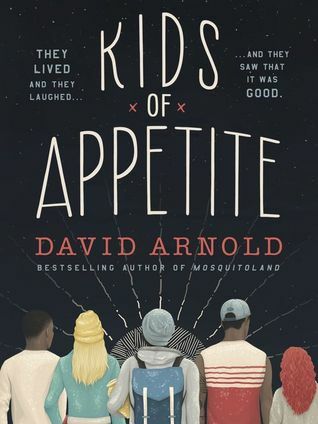 Fortunately, David Arnold is far more than capable, and KIDS OF APPETITE is an often poignant, occasionally hilarious, surprisingly twisty delight from start to finish. The central characters of KIDS OF APPETITE are a boy, Victor “Vic” Benucci, and a girl, Madeline “Mad” Falco, who meet by chance two years after the death of Vic’s father, and wind up profoundly changing each other’s lives forever. The narrative flips between both of their POVs, and alternates between their separate interrogations in a police station, and the events that brought them there. It’s a tricky structure, but it works. Both voices are sharp and distinctive, and the skips back and forth in time flow well, and are never jarring or confusing. Vic is a boy still grieving his father’s death following a long illness. After fleeing his house during a particularly upsetting night, Vic encounters Mad and the rest of the Kids of Appetite — Baz and Zuz, refugee brothers from the Republic of the Congo, and Coco, an 11-year-old girl with a boundless imagination and a penchant for swearing. The four Kids live together in a neglected greenhouse, where they spend their time musing upon life, making grand declarations, and, every now and then, deciding to take it upon themselves to make someone else’s life better. When Vic and the Kids collide, they set out on a mission to fulfill his father’s final wish, and in doing so, bring Vic the closure he so desperately needs. But even as they are all working to help Vic, Vic is focused on Mad, who, despite her guarded exterior, he suspects could use some help of her own. As the story went on, I fell in love with each of these characters. As in David Arnold’s previous book, MOSQUITOLAND, the members of his cast are like a bunch of mismatched puzzle pieces coming together to to form a sort of Wes Anderson-ized whole, full of quirks and flaws and idiosyncrasies that may make them an odd fit anywhere else, but work perfectly with each other. David Arnold’s great strength as a writer is in painting his characters with a vivid brush, and then stepping back and allowing them to shine through their dialogue as they interact with each other, and that talent is on full display here. In both the large moments and the small, loud and quiet, it was a joy to experience life with these characters, and to watch them live and laugh and see that it was good. I want to take a moment to talk about the disability representation with Vic, who has a rare neurological disorder known as Moebius Syndrome, which is characterized by complete or partial facial paralysis. Before reading KIDS OF APPETITE, I had never even heard of Moebius Syndrome, and certainly had never met anyone who had it. It was evident in reading Vic’s point-of-view that David was very aware that this might be the first exposure many of his readers have to Moebius, as well as the first time his readers with Moebius see someone like them represented in fiction. The care and attention to detail was clear, and there is an author’s note at the end which thanks four individuals with Moebius for consulting closely on the development of Vic’s character. While I am not disabled, I am a strong proponent of increased diversity in fiction, as I believe that reading about a broad spectrum of human experiences can only serve to increase empathy. There are so few books out there with disabled protagonists, and even fewer where the author really opened themselves up to input from the community they are aiming to represent. And while KIDS OF APPETITE is definitely not a book about Moebius, I really appreciated the thoughtfulness that went into crafting Vic and making sure that the portrayal of a character with Moebius was accurate. In the end, KIDS OF APPETITE is a beautiful story of grief and healing, of friendship and found family, of first impressions and broadened horizons, and of how you can know someone so well, yet discover there are parts of them you never knew at all. It is in turns funny and heartfelt, thrilling and surprising and gutting. It is a brilliant, honest, Super Racehorse of a book, and one I wholeheartedly recommend to anyone who loves great stories. Beautiful review! I haven’t yet read Kids of Appetite, but your recommendation moves David’s new book to the top of my Want to Read list.